The list of MSG side effects is absolutely astounding. Obesity is the least of your worries. MSG is a nearly ubiquitous food additive that is often disguised on food labels so you won’t know it is there. It won’t just make you fat. It can kill you. If this is such a big deal, why didn’t we know about it sooner? The nasty surprise is that we did, indeed, know about this problem as long ago as 1969. Yes, 1969! Ten years after the U.S. Food and Drug Administration classified MSG as a GRAS substance (i.e., Generally Recognized As Safe), a condition called “Chinese Restaurant Syndrome” entered the medical literature. Numbness and heart palpitations were some of the more common symptoms of this syndrome, which was quickly tracked down to being caused by MSG in Chinese food. Olney JW. Brain lesions, obesity, and other disturbances in mice treated with monosodium glutamate. Science. 1969. 164(3880):719-21. In newborn mice subcutaneous injections of monosodium glutamate induced acute neuronal necrosis [it destroyed neurons] in several regions of developing brain including the hypothalamus. As adults, treated animals showed stunted skeletal development, marked obesity, and female sterility. Pathological changes were also found in several organs associated with endocrine function. Studies of food consumption failed to demonstrate hyperphagia [not due to overeating] to explain the obesity. It is postulated that the adults syndrome represents a multifaceted neuroendocrine disturbance [lots of problems in the brain] arising from the disruption of developing neural centers concerned in the mediation of endocrine function [messed up the regulation of different glands]. You might criticize this early report because it entailed injecting MSG into lab animals, not consumption of MSG by humans. That was, admittedly, a preliminary look-see into the possibilities of MSG side effects. What about fast forwarding four decades and seeing what we know now? Interestingly, the FDA is not arguing with these as side effects of MSG. However, MSG remains on the GRAS list. Pretty idiotic, isn’t it? Oh, I would add one more side effect. My wife starts sneezing within minutes of consuming MSG. We have been surprised, both pleasantly and unpleasantly, by when and where this happens. 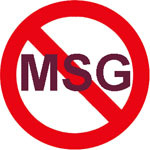 Many Chinese restaurants that claim to avoid the use of MSG are truthful, which is a pleasant surprise. Other restaurants still use it without warning, which is always an unpleasant surprise. EEK! Where is All That MSG Coming From? The dangers of MSG have become such a hot topic these days that they have been written about and discussed in forums on thousands of websites all over the internet. That is the good news. 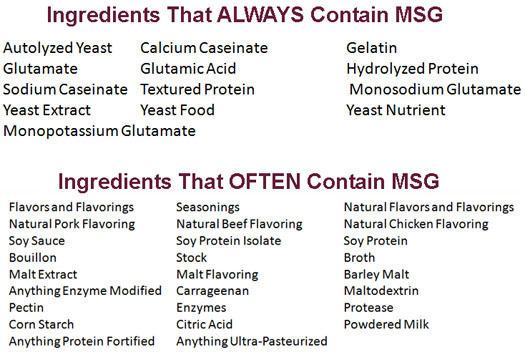 The bad news is that public awareness of and objection to MSG have grown to the point where food manufacturers have started disguising it on ingredients labels. This means that avoiding MSG is no simple task. It is definitely worth your while to be aware of where MSG pops up so you can make an informed decision on whether to allow it into your diet. Here is a brief summary that can guide you. 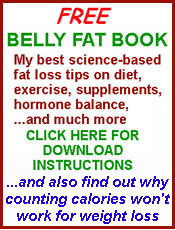 If all the dangers of MSG are not enough, at least be aware of its role in forming belly fat. Recent research shows that MSG disrupts the function of fat cells so that they are not as well regulated as they should be. That is just a fancy way of saying that MSG will make you fat. Get it out of your diet as much as possible. You might be surprised at how this simple step can help you with everything else that you are already doing for good long-term weight/fat management. I have been informed about the emphasis on saturated fat instead of the real culprits MSG and dietary sugat . Sometimes choosing the right foods for good health is like navigating a land-mine field, isn’t it? Take a look at this post that I put up earlier this week, in case you haven’t seen it already: Myths About Saturated Fat – Pure Medical Idiocy.